Yesterday’s trainer session was motivated in large part by my desire to get a decent bike workout in order to free today up for skiing. Yes, it’s October 27th. But I was still hopeful that conditions would be good for skiing. Dug, Rick, Ben, Jonnie J, Nate, and I met at the usual place at the usual time. Without the benefit of daylight savings being over, we had to pretend to be still making progress up the ridgeline above Greeley as if we were seeking an actual objective. In reality we were just waiting for it to be light enough to ski. Which, incidentally, is not the same thing as light enough to take quality photos. But you still get the point. And the point is, the skiing was good. Really good. Looking upon the powder I am about to harvest. Do you like my new green jacket? Turns out Dug has a new green jacket almost the exact same color. And he also wears black pants. Which is convenient, because now I can just take pictures of him and say they are me, and he can just take pictures of me and say they are him. Not sure who gets the better bargain, but it keeps things simple. 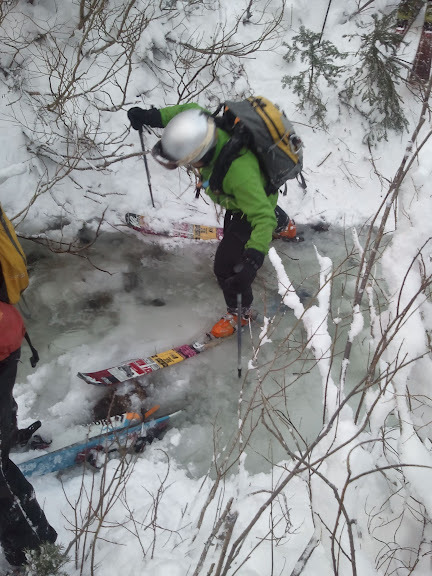 What wasn’t so simple was the exit, which included some bushwhacking and a stream crossing. But it was a small price to pay. Anyone who opted not to come so he could ride his bike instead chose poorly. But anyone who may have made such a decision would have already been aware of that without me pointing it out. It’s still snowing today. My alarm clock is set for tomorrow. I’ve been informed that someone who didn’t choose wisely today has already cleared his calendar. It was a "good" day. And by "good" I mean "Fantastic". Rick, I knew what you meant. So pissed. 8am meeting tomorrow morning as well. Friday DP anyone? Aaron: High of 45 tomorrow. I think tomorrow may be it. At least until next week. Not to rain on the parade, not really all that pissed about this, but you guys need to be a little more judicious in your travel habits. You don't ski directly onto people uptracking below you. Granted today there wasn't an issue avalanche wise, but you still just don't do it. It is a very bad habit...it literally would have taken you 1 minute to let us get out of the way. Glad you all had a good morning. Kikkerts: my apologies if I did something wrong. I don't recall skiing on to any other parties coming uphill, though I do recall someone way off to the side while I was descending a mellow slope. The sheep pen is crowded, and when people are on dawn patrol, it's usually to get to work by a certain hour. If you're taking advantage of someone else's uptrack, you ought to also be prepared for them to come back down the hill. With low light and terrain features, it's not always possible to see everything below you. Not that it's an issue when the slope angle is maybe 20 degrees and "skiing directly onto" has been used extremely liberally. But you know what I mean. Looking forward to seeing you again. We're always happy to break trail. Not a huge deal. I understand the morning rush, just wanted to point it out on a day where it wasn't a serious issue (by the way, it wasn't a 20 degree slope, it is actually one of the few pockets in there that can come out...although not often...note the bomb tram directly to the west). Also, your right, it wasn't "directly" onto us, but we were in a location that had something occurred, it could have caused problems for us. Again, not a big deal, just a heads up. The pen is crowded...which is all the more reason to be careful...and the reason I even took time to comment here. The "rush to the barn" syndrome is often when accidents occur (also having broken trail is never an excuse to drop in on people...especially in the Wasatch...where every skin track is going to be re-used). Anyway...I won't go on and on forever. Good to have snow (until it all facets). Kikkerts: the bottom line for safe travel is making decisions based on conditions. What may be a safe decision in one set of circumstances may not be in another. We chose to ski that slope based on conditions. We'd choose not to ski it other days if there were avy danger or were it during the season and closed to uphill traffic. Likewise, how we approach a slope with other skiers on it, whether from our party or another, will vary with conditions, and we'll do what's safe regardless of whether we put in the skin track or not. Thanks for the reminder about safe travel protocol. OK...I really am going to quit...I hate internet fights...you guys seem nice...and I don't want to ruin the stoke. Having worked for many years as an avalanche forecaster, I know how avalanche hazard evaluation works. Lets just all remember to be safe out there this year. Kikkerts: "...I don't want to ruin the stoke." So glad to hear that. Anyone here. As fun as intervals at lunch time in 38 degree weather were, I did in fact choose poorly. However, I didn't encounter any cars on the Salt Aire frontage road who would have warned me about the dangers of riding in the middle of the road close to oncoming traffic. Internet fights very intertaining when you're not in the fight. Come on Kikkerts, the ball's in your court. "I wanna ski all morning and internet fight every-day". Don't you people have jobs?!? Turbo: Yes, I have a job, but I don't have three lawns to maintain. That is all.